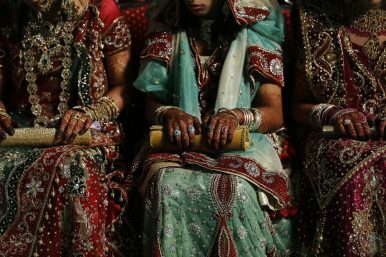 Muslim brides wait for the start of their mass marriage ceremony in Mumbai, May 11, 2014. In a landmark judgment that is being hailed as a victory for women’s rights, and a body blow to entrenched patriarchal norms, the Indian Supreme Court has declared the custom of triple, or instant talaq (divorce) unconstitutional and illegal. In one of its most keenly awaited judgments in recent history, the apex court quashed the contentious practice of instant triple talaq which allows Muslim men to divorce their spouses by simply uttering the word “talaq” (divorce) thrice in succession. The absurdity of the ossified, medieval ritual has led to Muslim women being divorced over Whatsapp, phone calls and e-mails in recent times. Religious officers and priests, the main proponents of the regressive practice, have often misused their position and clout to deprive Muslim women of their right to equality. Despite the public euphoria over the court’s judgment, however, there was a moment of dissonance when two judges issued a minority view supporting triple talaq on the grounds that it has been in place for the last 1,400 years. They pointed out that reforms to “personal law” in India, with reference to socially unacceptable practices, should not come about by way of legislative intervention. Overruling the objection, the court said that what is bad in religion is also bad in law and therefore the discriminatory practice must end. The judgment referred to 13 Arab countries, and three states in Southeast Asia and the subcontinent which have enacted laws to protect women. Instant talaq is prohibited across a wide swathe of Islamic nations including Sudan, Egypt, Iran, Jordan, Morocco, Tunisia, Algeria, Yemen and Iraq, in addition to both Pakistan and Bangladesh. Celebrated Indian actress Shabana Azmi said the verdict is a welcome measure as triple talaq does not have religious sanction and is patently unjust and anti-women. “It has no place in a secular India,” she said. India — the world’s largest democracy — is home to the world’s third-largest Muslim population which is governed by the Muslim Personal Law (Shariat) Application Act of 1937, as interpreted by the All India Muslim Personal Law Board. The board members oppose “interference” in the “divine” law from governments and policymakers who have in the past attempted to regulate it. This has resulted in India’s 90 million Muslim women remaining vulnerable to the threat of a sudden, oral, and out-of-court divorce. The new ruling will thus have a positive and far-reaching influence on one of India’s most sizeable demographics. India’s current Muslim population, pegged at 189 million (roughly about 14 percent of the country’s 1.3 billion people) is projected to surge to 300 million by 2050. This will make India the country with the largest Muslim population in the world according to the Pew Research Center, a U.S.-based think tank. Although the Indian constitution envisages a Uniform Civil Code (UCC) that applies to all communities, India does not currently have one. While enacting a law for the majority Hindus, the framers of the Constitution (around the time of partition in 1947) allowed each religious community to have its own laws governing marriage and divorce. This is how Muslims came to follow sharia in marital matters. However, Rubina Patel, an activist, who has been fighting for the rights of Muslim women for years and is a victim of triple talaq herself, says sharia is not even a written law. “It is blatantly anti-women with Muslim clerics interpreting law in a manner that favors men and violates women’s dignity,” she says. Patel’s organization — Muslim Mahila Manch — had filed a petition to ban triple talaq; the activist felt that Muslim law allows no freedom for women and does not provide for their rights. “We need a law that ensures social security for women. The rules for their education, employment and development must be clearly defined.” The activist has even demanded that the law should also provide justice and monetary recompense to women who have been a victim of triple talaq. Though the ruling political coalition — the National Democratic Alliance (NDA), led by Modi’s Bharatiya Janata Party (BJP) — has been quick to appropriate credit for the historic judgment, the real heroes for ushering in this change are Muslim women like Patel who have valiantly fought for years to get this heinous practice abolished. The verdict is thus not only a fitting riposte to entrenched discriminatory personal laws, but also aligns India’s Muslim personal laws with those in most Islamic nations that have already outlawed triple talaq. The abolition also paves way for policymakers to frame a gender-just civil code based on the principle of equality. However, legal eagles say that though the triple talaq judgement marks an important development for Indian Muslim women, it is only a baby step towards their emancipation. It does not, for instance, address issues like polygamy or even the more complex issue of talaq-e-ahsan and talaq-e-hasan, two other convenient ways in which Muslim men can still divorce their wives. The existing personal laws premised on religions means that individuals of different faiths are subject to different laws. This asymmetry violates the principle of equality in a democratic country. Dalal adds that politicians have always found it beneficial to play politics by trying to appease different castes and groups instead of attempting to integrate all sections of society under a uniform civil code. The code, she adds, will allow all Indian citizens to follow the same laws irrespective of their faiths and be treated equal in keeping with the secular tenets of the constitution. Experts say that one civil code for the entire country would go a long way toward improving the condition of Indian women who are exploited and subjugated due to misogynistic social norms. While India’s economic growth has been the world’s envy, its social growth leaves much to be desired. The country has been trailing on vital human development indices like maternal mortality rates, women’s education, and empowerment due to skewed policies and prejudiced mindsets. When the current political coalition came to power in 2014, it said that it would usher in laws to regulate marriage and divorce among Muslims if the court holds triple talaq as invalid. It’s time now for it to put its money where its mouth is. Neeta Lal is a New Delhi-based editor and journalist. A political analysis of the long-running conflict.